The Classic Touring Car Racing Club's Mallory Park Classic Festival on 18/19 June will feature the best of classic competition, from the host club's classic saloons to the Lansdowne classic 350 and 500cc GP motorcycles. The meeting will feature all the categories from the Classic Touring Car Racing Club portfolio, the inaugural Alfa Romeo Owners Club "On Track" event featuring races for this iconic marque and a Championship sprint meeting. The Classic Touring Car Racing Club was founded in 1974, when a group of amateur racing drivers got together to form a club which would promote affordable racing for the popular saloon cars of the 1950s and early 1960s. During the ensuing years, the club has evolved and expanded as times changed somewhat, but the watchword in all the regulations is still stability, which ensures the return of competitors year upon year. 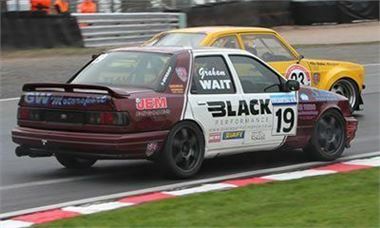 Today, the Classic Touring Car Racing Club runs - in conjunction with the British Automobile Racing Club - six championships for production saloons at eight venues throughout England and Wales. The Thermex Classic Saloons & Historic Touring Car Championship - Pre 1966 saloon cars, featuring iconic Lotus Cortinas dicing with Mini Coopers and Ford Anglias. The Autoglym Post Historic Touring Car Championship - Pre 1974 saloon cars, tail-happy Ford Escorts, Triumph Dolomites and Ford Capris fight it out "Life on Mars" style. Hammerite Racing Classic Group One Touring Car Championship - Pre 1983 saloon cars, lairy V6 Ford Capris battling with V12 Jaguars and V8 Rover SD1s. Sub-Zero: Wolf Classic Thunder Championship - lightweight slick-shod classics battle with flame-spitting turbo monsters. Pro-Driver Blue Oval Saloons - fearsome turbocharged Cosworths battle against the classic Mk1 and Mk2 Escorts of the 1970s and 1980s, along with a group of nimble yet quick Fiestas. The Alfa Romeo Owners Club was formed in 1964 and has grown to a membership of some 4,000, covering all the marque's various models and with an enthusiastic regional presence. AROC is actively re-vitalising its competition activities and the Mallory Classic "On Track" will see its major event of the year. The motorcycle action will be provided by the The Lansdowne Classic Series, an official British Championship under the title "The British Historic Grand Prix Championship". This series is the most prestigious championship of its kind, catering for 500cc and 350cc Grand Prix machines of the type raced in the 1950s and early 1960s. Rounding off the Classic weekend's programme will be a Championship Sprint Meeting. "Recreating the spirit of classic touring car racing for the club competitor of today"